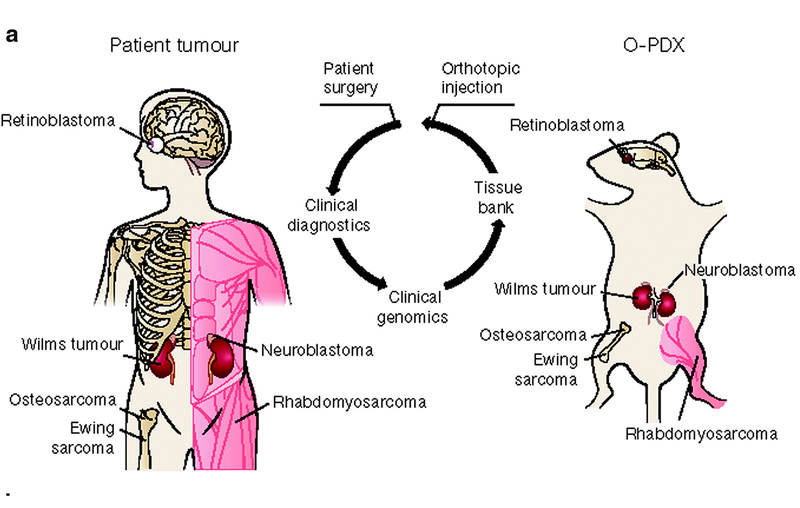 Generation of paediatric solid tumour O-PDX models. (a) Drawing of orthotopic implantation in immunocompromised mice. The human microbiome is being associated with an ever-growing set of effects on human physiology, both negative and positive. The present example investigates a gut microbe as the source of a specific molecular agent that aids the human immune system in its response to influenza infection. The study focusses on the long-standing observation that the severity of an influenza infection is strongly affected by the immune status of the human host, as well as by other factors such as microbiota and nutrition. Focusing on type I interferon innate immune response, the authors screened a set of 84 metabolite molecules associated with microbial life cycle for their effect on interferon signaling and the associated defense from influenza infection. It was discovered that desaminotyrosine, a metabolite produced by the gut microbe Clostridium orbiscindens, was responsible for a strong inducing effect on interferon activity (Figures). Further investigation indicated that the effect of desaminotyrosine can be protective in nature, that is, a pretreatment with the metabolite in a mouse model provided the animal with significantly improved ability to fight off the infection, while delivery of the metabolite after infection did not have the same beneficial effect. Desaminotyrosine production is enhanced through flavonoid metabolism, and this may partially explain the beneficial effect of some flavonoid-rich foods. Engraftment efficiency for diagnostic and recurrent samples (c), primary and metastatic samples (d), and pretreatment versus samples collected during treatment (e). The numbers of tumor specimens are indicated over each bar from Supplementary Table 1. DSRCT, desmoplastic small round-cell tumor; EWS, Ewing sarcoma; HGS, high-grade sarcoma; NB, neuroblastoma; OS, osteosarcoma; RB, retinoblastoma; RMS, rhabdomyosarcoma; WT, Wilms tumor. The microbiota is known to modulate the host response to influenza infection through as-yet-unclear mechanisms. We hypothesized that components of the microbiota exert effects through type I interferon (IFN), a hypothesis supported by analysis of influenza in a gain-of-function genetic mouse model. Here we show that a microbially associated metabolite, desaminotyrosine (DAT), protects from influenza through augmentation of type I IFN signaling and diminution of lung immunopathology. A specific human-associated gut microbe, Clostridium orbiscindens, produced DAT and rescued antibiotic-treated influenza-infected mice. DAT protected the host by priming the amplification loop of type I IFN signaling. These findings show that specific components of the enteric microbiota have distal effects on responses to lethal infections through modulation of type I IFN. ASSAY & Drug Development Technologies, published by Mary Ann Liebert, Inc., offers a unique combination of original research and reports on the techniques and tools being used in cutting-edge drug development. The journal includes a "Literature Search and Review" column that identifies published papers of note and discusses their importance. GEN presents here one article that was analyzed in the "Literature Search and Review" column, published in Science titled "The microbial metabolite desaminotyrosine protects from influenza through type I interferon", authors are Steed AL, Christophi GP, Kaiko GE, Sun L, Goodwin VM, Jain U, Esaulova E, Artyomov MN, Morales DJ, Holtzman MJ, Boon ACM, Lenschow DJ, Stappenbeck TS.